AR fiberglass roving 14.5% is an AR glass chopping roving mainly designed for use in the manufacture of GRC composites by the manual spray method. It is designed for optimum processability. It is used in the manufacture of GRC architectural panels and other building elements, civil engineering and infrastructure components. been approved by Sheffied University,UK. It is designed to be unwound internally. They are protected by a shrink-wrap polythene film which should not be removed when used. Each roving is identified by an individual label and packed in a carton. AR fiberglass roving 14.5% is white coloured but an orange colour is used on labels and shrink-wrap to aid identification. For sea transport, a maximum of 20 pallets (on two levels) may be loaded in a 20 foot container, giving a total net weight of approximately 17-20 tonnes. 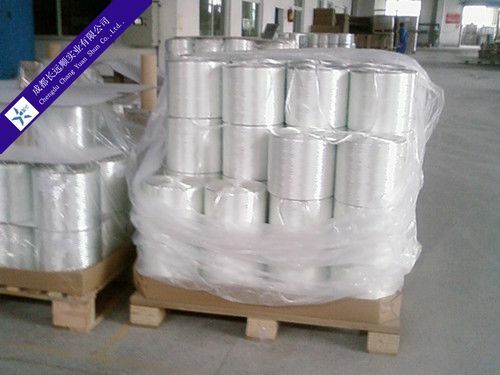 AR fiberglass roving 14.5% should be stored dry in their original packaging, the best conditions being at a temperature of between 15℃-35℃ and at a relative humidity of between 35% - 65%. If the product is stored at low temperature (below 15℃) it is advisable to condition in the workshop for 24 hours before use to prevent condensation.